I’m not proud of the person I was, and I have to admit it wasn’t easy to change. Even after I became a Christian I struggled … a lot. The cuss words still slipped out. Unclean thoughts continued to pop into my head. I was selfish, and I often put my needs before others. I remember going through my whole day without even thinking about God. So what changed? And how? 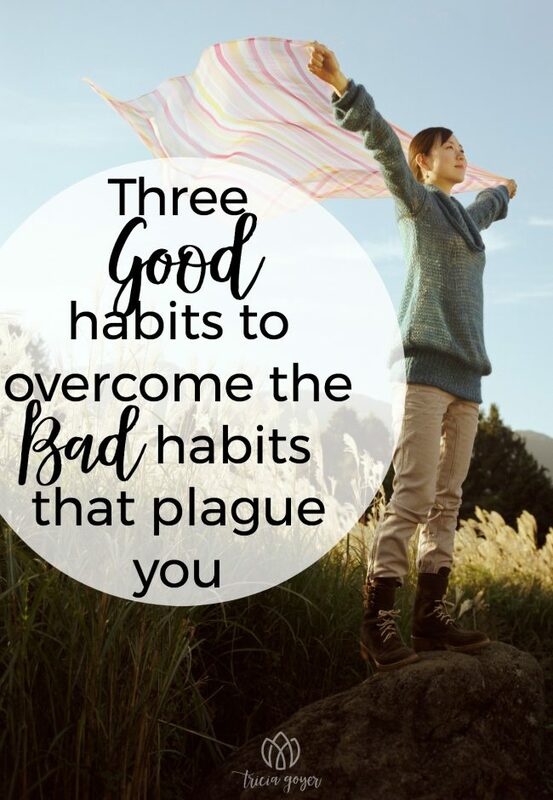 Here are three good habits that changed everything. 1. Daily Bible Reading. In my early 20s I was a young mom with two babies, and I decided that I would get up fifteen minutes early a day to read my Bible. I set an alarm to wake up. Before this time I was not a morning person, and it was ROUGH. Yet soon I discovered it was worth it. Everything changed when I focused on God’s Word first. I had a better attitude. I started acting better. The more of God’s Truth that I put into me, the more that truth impacted every part of my life. 2. Journaling. I’m not one of those people who write pages and pages within my journal every day. Instead it’s more simple than that. After I read a Bible chapter or two I’d write down a Scripture that stood out to me. I’d also write down a thought or prayer that came to mind. Sometimes I’d write down a personal application. Then I started thinking about how God’s Word applied to my life. This greatly impacted how I lived my days. 3. Sharing. I’ve heard it said that the best way to learn something is to teach it. Mostly, I did this through writing. Even before I was published I would write short devotions and share with prayer partners and friends. I’d also shared what I read with my husband John. When my kids got older I shared it with them. Once Facebook came around I shared there. God’s Word has transformed my life, my heart, my attitude, and my actions. I’m a different person because I made it a priority to feed my soul with God’s Truth. My desire is to help others embark on a similar Scripture Reading Journey. That’s why I started a 365-Day Reading Plan. You can join me any time here. Every weekday we read about five chapters. The weekends are for rest or catching up. This group is also a place you can share a meaningful Scripture or share what you feel God is placing on your heart. (Reading, journaling, and sharing all in one!) Please join us and please invite your friends! I know God is going to transform my heart this year as I read His Word, and I hope He’ll do the same for yours. May we all be changed to be more like Christ. May we change, this year, for the good. Want a chance to win 20 books from me? 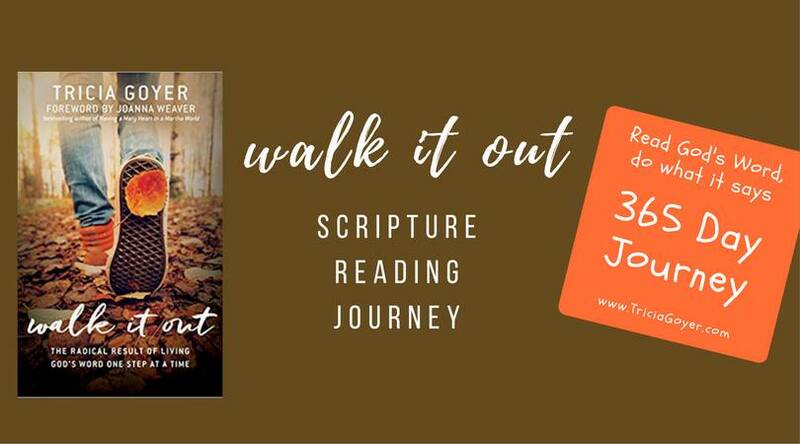 Share your life-theme Scripture verse with the hashtags #triciagoyer and #walkitoutnov on Facebook, Instagram or Twitter (bonus points for a cool graphic and additional hashtags!) Click here for more information.